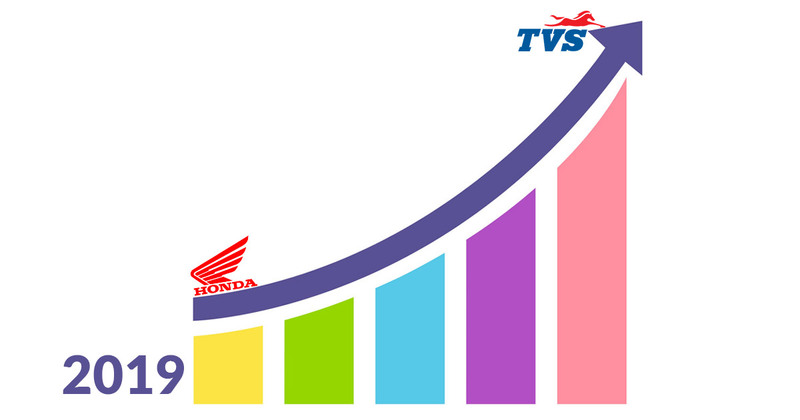 TVS Motors has superseded Honda from the position of second highest-selling two-wheeler company in the month of March 2019. Last month, where the recorded sales numbers from Honda stood at 2,22,325 units, TVS, on the other hand, managed to sell 2,47,710 units, which was 25,385 units more over the Honda. Whereas, on a year-on-year basis, both the manufacturers registered a decline in their sales last month. With a downfall of 6.6 per cent, TVS Motors recorded the sales of 2,65,166 units in March 2018. On the other end, Honda which dispatched a sum of 4,17,380 units in the similar month last year, endure a drastic fall of 46.7 per cent this year. You will be surprised by knowing that the Japanese giant manufacturer has been facing a drop in sales for its most selling products. For example, Honda Activa, which is the brand’s best seller, indexed a fall of 17 per cent in the month of February this year as compared to the similar month last year. Next, in line, the Honda Grazia registered a downfall of 65 per cent in sales in February this year. If compared with its rival, TVS Ntorq 125 scooter earned a whopping hike of 97 per cent in its sales in a similar month. Not even TVS and Honda are going through the bad phase in terms of sales but also there are other manufacturers like Hero MotoCorp and Royal Enfield which have also faced such dip in sales in March and bearing the same from a few months. The implementation of new safety norms and increased prices of the two-wheelers due to the insurance regulations can be considered as the reason behind such slow down in the Indian two-wheeler market.